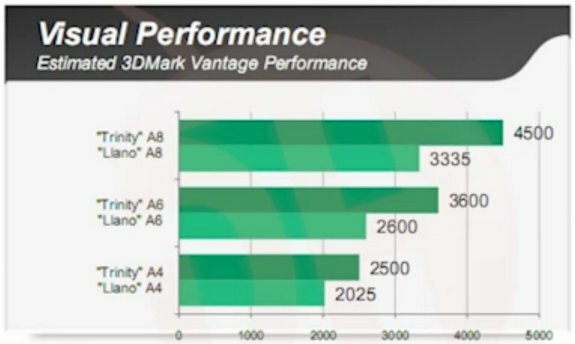 TPU published some slides that reveal AMD's estimated performance of their Trinity APUs. To begin with, AMD is promising noticeable performance improvements over the current "Llano" APU. It spread its benchmarks across three categories: visual performance (using 3DMark Vantage), general performance (using PCMark Vantage), and parallel compute (GPGPU) performance (calculated CTP SP GFLOPs). With 3DMark Vantage, Trinity A8 (quad-core), A6 (triple-core), and A4 (dual-core) APUs are seeing a roughly 32% improvement over their respective Llano-based counterparts; with general performance, the improvement is a candid 13.8% on average; but with GPGPU performance, the improvement is a massive 56.3% on average. This could be attributed to the VLIW4 architecture. Lastly, there are notable CrossFire dual-graphics performance improvements.